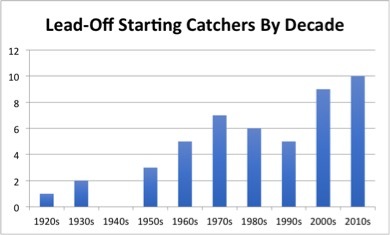 A leadoff catcher is more common than it’s ever been, and yet it’s still exceedingly rare. It became less rare on Monday when Curt Casali led off for the Reds. A leadoff hitter is not so much a specific baseball player as he is a concept. You can’t name every guy to lead off this season, or this week, or even last night, but you can explain exactly what a leadoff hitter feels like. There are no hard-and-fast rules for how much he should get on base or how speedy he should be, but, Potter Stewart-style, you probably know it when you see it. It’s weird! It’s definitely weird. A catcher can lead off, sure; J.T. Realmuto, maybe, or prime Iván Rodríguez, or a pre-second-base Craig Biggio. But Curt Casali? (Casali himself was surprised about it; the career backup catcher is a solid hitter for the position, and he’s off to a strong start at the plate, but… leading off, really?) The Reds' backstop didn't spoil his time as the No. 1 hitter. He finished Monday's 4-3 loss to the Dodgers 1 for 4 with a double, scoring the go-ahead run in the ninth before Joc Pederson ended the game with a walk-off in the bottom half of the frame. Baseball’s collective notion of a “leadoff hitter” has certainly—rightfully—relaxed in recent years, expanded by data and other strategic developments. But a lingering question remains: How much has our collective notion of a leadoff hitter really expanded here? Depending on how you want to look at it, either enormously, or not so much. Casali is the 10th catcher this decade to start at least one game as a leadoff hitter, which sets a record, but… it’s still only 10 in an entire decade. And for most of them, leading off was hardly a regular, or even semi-regular, occurrence; seven of the 10 led off for five or fewer games. (He joins Realmuto, Russell Martin, John Jaso, Jonathan Lucroy, Derek Norris, Willson Contreras, Francisco Cervelli, Andrew Knapp, and Francisco Mejia.) A leadoff catcher is more common than it’s ever been, and yet it’s still exceedingly rare, something you might see for a total of a few hundred plate appearances in every few years combined. In fact, Casali is the first Reds catcher in the modern era to start a game batting leadoff, according to the Elias Sports Bureau. When Connie Mack revised his batting order recently and made Mickey Cochrane, catcher, lead-off man, he did something unusual in major league annals. For it is a rare thing, especially in the big circuits, to have a catcher at the head of the line-up. In the old days backstops were just about as sure of hitting eight as the sun was of setting in the far-away west. But in more recent seasons some of the pilots have boosted their receivers in the batting order, a few even making cleanup hitters of them. To have a catcher top the list is extremely out of the ordinary, however. Mack seems to have the right hunch with Cochrane though. For in the tot’s first 11 trips to the plate he came through with seven safeties. The west is no longer “far-away” for Major League Baseball, and no one ever calls managers “pilots” or rookies “tots” or plate appearances ending on base “safeties.” (Though, really, perhaps everyone should.) Otherwise, the paragraph might as well have been lifted from 2019. A leadoff catcher is a rare thing, indeed—and, on Monday, ever so slightly less rare with Curt Casali.